Should I write in Thai or in English? Superficially, in 1946 there were ‘four’ PMs. But there was only one real leader throughout the whole period from the end of the war to the coup of 1947, i.e. Pridi Phanomyong. In fact virtually all Ministers in the ‘Seni’ Cabinet was selected for him by Pridi, Seni only came back from the US to assume the post of PM. (When Pridi decided to give the post to Seni, the Allies were very surprised by the decision. They thought Pridi would/should assume the post himself.) This was also true of the Thamrong Cabinet. In fact major decisions by the Thamraong Cabinet had to be approved by Pridi himself (I’ve read the minutes of all their meetings.) Only Khuang Cabinet can be said to be р╕Др╕▓р╕Щр╕нр╕│р╕Щр╕▓р╕И (counter-weight) to Pridi group. By the way, shouldn’t the CCP be regarded as Asia’s second oldest party behind the KMT? Thank you very much for your comments. I will be more careful next time. Three governments in the year were Pridi’s, but only two PMs are his. Several evidences have shown that the other two were anti-Pridi. CCP is not a political party in a parliamentary system, it may not be counted by the following Wikipedia article. When Pridi decided to give the post to Seni, the Allies were very surprised by the decision. They thought Pridi would/should assume the post himself. 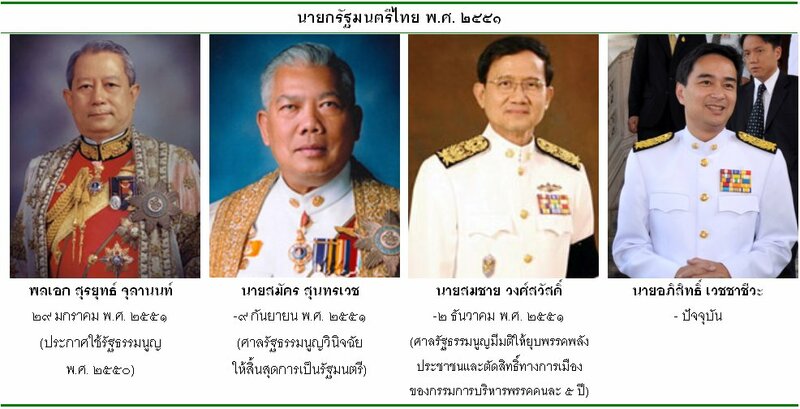 Why did Pridi give the post to Seni, Khun Somsak? In my interpretation based on both my reading of documents and talking to people of that period, Pridi had a personal trait, a kind of ‘aversion’ to taking highest office (unlike Phibun). I’m reluctant to call it ‘humility’ or ‘lack of ambition’ (though some of his supporters claim that’s what it was). It’s also known that he’s not used to political attack, he lost his temper easily (too ‘thin-skin’ to be a politician, so to speak). That Pridi was alsways ‘aversed’ to taking highest office and prefered to ‘act behind the sceen’ (his opponets would say, ‘like a puppet master), is the basis for a story, widely told among people who lived through that period that, when Pridi assumed the Premiership, he was in fact ‘lured into a trap‘ by Khukrit Pramot. It is said that Khukrit knew very well Pridi’s weakness (short-tempered when being attacked, etc). So after Khuang resigned, Khukrit went to see Pridi and persuaded him to assme the post. I’m not sure how reliable is the story. In any case, as I see it, Pridi did seem to be a kind of person very unconfortable in the open top job. In other words, he seemed unsuit to the role of a politician. In fact even after the general elections in early 1946 (following Seni’s dissolution of parliament), most people thought Pridi would take the PM job, now that the initial dealing with tha Allies (that he ‘delegated’ to Seni) was over. But he declined and instead proposed his follower, Direk Chai-ya-nam. Direk was not a match to Khuang in terms of popularity, so Khuang won the vote in the house and took the job. Regarding the specific choice of Seni after the war, Pridi offered the reason that Seni was leader of the Free Thai abroad and former minister to the US and therefore would be best suit to deal with post-war negotiation with the Allies. But this was unconvincing. During the war, the Allies always regarded Pridi (‘Ruth’) himself as the one true leader of the whole movement and, as I said (based on US State Department and UK FO documents at the time) they were surprised Pridi wouldn’t take the PM job. p.s. Please feel free to correct any errors in my Thai. Thanks. To be frank, I simply couldn’t see any point in your historical comparison/analogy. Apart from the fact that there is ‘same’ number of PMs in 1946 and 2008, the situations behind the two periods that produced this number are totally different. In 1946 politics was dominated by, or under the leadership of, just one man – Pridi Phanomyong. Neither the ‘Thamrong’ nor the ‘Seni’ Cabinet can be said to be really Thamrong or Seni Cabinet – both were Pridi Cabinet, literally! So even the ‘same’ number of ‘four’ turns out to be illusory and . At present, that there have been four PMs in one year reflects the situation of gigantic struggle between two Power Blocs that are – temporally – quite equally balanced, though they are based on different socio-political settings – rural popular electoral supports vs Palace-Military-Judiciary-urban middle classes. These socio-political settings were largely non-existent in 1946. The Palace-Military partnership didn’t come into existence until ten years later – the first time since 1932. The Judiciary was still largely non-political. And neither rural electoral power nor urban middle classes can be said to emerge yet until many decades later. All historical analogy/comparison have limits, but I’m not sure there should even be one here in the first place. By the way, I’m not at all convinced the CCP should not be counted as Asia’s second oldest party because it’s not parliamentary. For a very long time in its history, the KMT was not a parliamentary party either. Thank you again for your comments. Your historical point of view is precise, i.e. only number is the major point here. Well, I intend to make it satirical/humerous. Next time, I will find the topic which will be acceptable to historians as well. I appreciate your remark here in the future. In this field, I’m only a young boy. I hope that I will learn a lot from this community, so any comments and suggestions are welcome. Just take it easy as to teach a young boy. Well, in other field, I might be a baby or an old man. Anyway, age shouldn’t be a barrier for an academic exhange. In this field, I’m only a young boy. I hope that I will learn a lot from this community, so any comments and suggestions are welcome. Just take it easy as to teach a young boy. The first round of Phibun’s regime only lasted 5 years 7 months (mid December 1938 – end of July 1944) not ‘almost 8 years’. If I wanedt to argue about number I could have said this from the beginning. It’s you who make illusory number into false historical analogy. The story of Pridi and Kukrit is quiet interesting. I appreciate Dr. Somsak’s lesson. It is the best thing I can get here apart from criticism T_T. Well, there should be a room for metaphor and imagination. Too many ‘facts’ are boring! I think one can provide critique of other’s work without having to assume the condescending tone the way u do. The author has shown admirable humility and is very open for comments and criticisms. Too many ‘facts’ are boring! Humor is a very difficult form of writing, much more difficult than ‘straight’ narrative. Unless one has a sure grasp of most or all the facts and a sharp idea of how to interprete them,, one will not make a good ‘light-hearted’ story out of them, only lame jokes, as in this case. If I really wanted to be ruthless, I’d have pointed out, besides the issue of the duration of the first Phibun regime, that much of the author’s first reply (#2) is either inaccurate or besides the point. Take, for instance: “р╣Ар╕Юр╕гр╕▓р╕░р╕Ыр╕гр╕╡р╕Фр╕╡р╕Др╕гр╕нр╕Зр╕нр╕│р╕Щр╕▓р╕Ир╕бр╕▓р╕Хр╕▒р╣Йр╕Зр╣Бр╕Хр╣Ир╕кр╕┤р╣Йр╕Щр╕кр╕Зр╕Др╕гр╕▓р╕б”. Pridi in fact assumed power before (not since) the end of the war, i.e. following Phibun’s fall in July 1944. 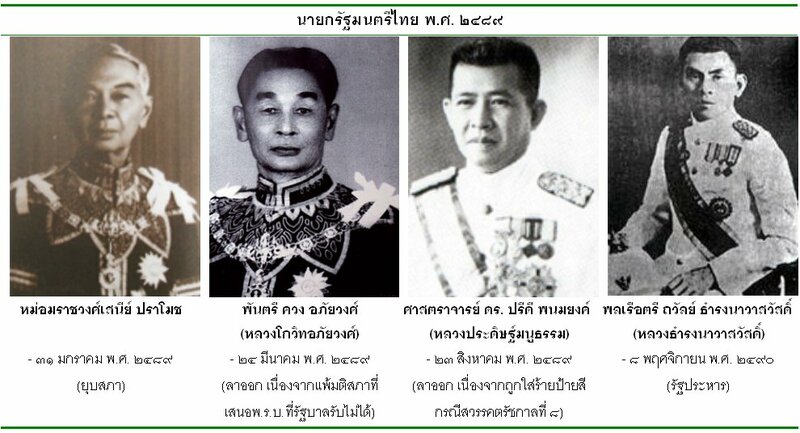 The first Khuang Cabinet (August 1944-45) was in reality Pridi (‘Free Thai’) Cabinet. In fact Khuang hardly played any important role at all apart from ‘clowning around’ for the benefit of the Japanese. The key point, however, is that the author of this post has no understanding of the reality of the post-war politics, hence his ‘humorous’ ‘take’ on the number ‘4’. No “evidence” would have shown that Khuang was ‘anti’ Pridi during his brief Premiership in 1946, certainly not in the sense that Surayut and Abhisit are anti-Thaksin. Khuang had been driven into the anti-Pridi camp because of his disappointment with Pridi’s support of Direk as candidate for PM, but much more because of the circumstances of his fall from office (which he believed was engineered by Pridi). He was in fact not the main driving force behind the formation of the Democrat Party. Even Seni, one could argue, based on ‘several evidences’, that during his Premiership, though he was unconfortable working with Cabinet that Pridi set up for him, was not yet fully-committed anti-Pridi, again very unlike Sorayut or Abhisit. So the number of ‘4’ PMs in both 1946 and 2008 turns out to be not only superficial, but misleading. In my view, one of the major factors, which greatly contributes to the anti-politician/ pro-monarchy trend among both Thai and foreign intellectuals in recent years, is that they thought they ‘know’ Thai political history very well, but in fact they don’t. This shows in the often unbelievably very sloppy way they talk about certain facts. Take this piece from Pornpimol Kanchanalak in the Nation, mentioned in another post here. “….he most savage retribution against our own on October 6 two years later. The October 14 uprising, of course, happened in 1973 while the October 6 massacre took place three years later. That both Pornpimol who actually lived through that period (and claims that she knows Thai politics than those ‘western scholars’) and The Nation’s editors, could let ‘slip’ such well-known historical facts, testifies to the sloppiness I just said. P.S. I also recall an example here sometime ago when ‘Taxi Driver’ thought he ‘know’ what kind of armed forces took part in the October 6 massacre. By the way, I also never conside 4 deads from brutal political assassination a good ‘material’ for such ‘humorous’ quip.